Stale Solbakken got his first away win as Wolves manager with a victory at struggling Ipswich. Tommy Smith scored an own goal when he turned in Bakary Sako's free-kick from the edge of the six-yard box. 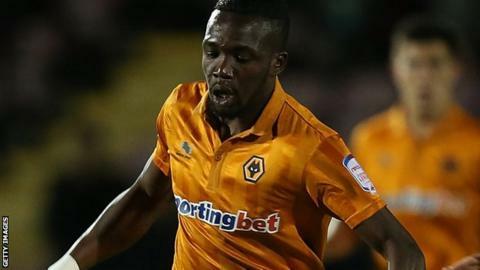 Mali international Tongo Doumbia added a second for Wolves with a fierce drive from outside the area that gave goalkeeper Scott Loach no chance. Kevin Doyle also went close for Wolves with two powerful strikes as Ipswich remained in the relegation zone. Paul Jewell's team are second from bottom of the Championship with the worst goalscoring record in the division. After a low-key first half, the home side did produce a promising spell but Lee Martin and Paul Taylor were both thwarted by Wolves centre-back Roger Johnson. Tractor Boys striker Daryl Murphy also went close when he fired a shot wide from the centre of the penalty area after getting on the end of an Aaron Creswell free-kick. But the home side did themselves no favours with the own goal on 66 minutes and Doumbia's second for Wolves, 11 minutes later, only served to increase the pressure on Jewell. "We're not just missing half-chances - they're gilt-edged opportunities. "We were the better side but we were wasteful, just as we had been on Saturday [a 2-0 defeat at Middlesbrough]. "If we'd got the first goal, the confidence would have flowed. Instead, we're edgy and there's no easy way out of the situation we're in. "That's life and that's football, but as manager I take full responsibility." "We were pleased to win our first away match of the season. It was hard work and could have gone either way. "In the first half both teams were very organised. There were few chances and it was hard for both sides to open each other up. "In the second half there were a lot more chances, though. "The Ipswich defender [Smith] was very unlucky [with the own goal] but we haven't had much luck so far so maybe it was our turn."